The survey form appears on pages 59 and 60 of the May/June issue, recently sent to subscribers. We ask that you tear out that page (photocopies will not be accepted) and mail the completed form before July 1. Just pick up a copy of the May/June issue (the one with the about-to-land, female Black-chinned Hummingbird on the cover), and turn to page 59. Start making notes about which squirrel baffle, 7x42 binocular, tripod, regional field guide, festival, national forest, listserv and other items fit your definition of "best." At the end of April, I'll return to the lower Rio Grande Valley for the Great Texas Birding Classic. For almost every one of the event's 10 years of existence, WildBird has sponsored a team in the weeklong tournament. This year is no different. WildBird and Nikon are co-sponsoring four fellows: Michael Retter (captain), Mike Freiberg, Cameron Cox and Ken Behrens. Between April 25th and 29th, they'll sleep a little, eat a little and bird a lot. They'll scour the state for species, racking up the IDs so that they can claim first place in the weeklong tourney. If they earn that honor, the Nikon WildBirders will get to choose a habitat conservation project in Texas to receive thousands of dollars. Previous teams have earned the first-place title six times. One team earned second place -- also an opportunity to designate a habitat conservation project. We're quite proud of "our" young birders' skills and pleased to have the opportunity to participate in a habitat conservation program like the Classic. Don't miss today's installment of the avian blog carnival at Bootstrap Analysis. Two upcoming installments need hosts! If you're itching to try your hand as a host with the most, contact Mike. I had a great time working with him on the Feb. 16 carnival. In about 10 days, I'll join the 2005 Birder of the Year, Leigh Johnson, and her mom in Harlingen, Texas. 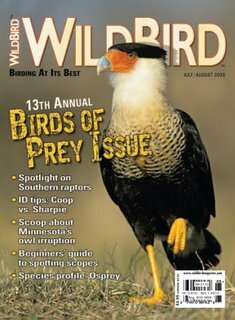 Leigh earned the Birder of the Year award after receiving the most votes from WildBird readers. 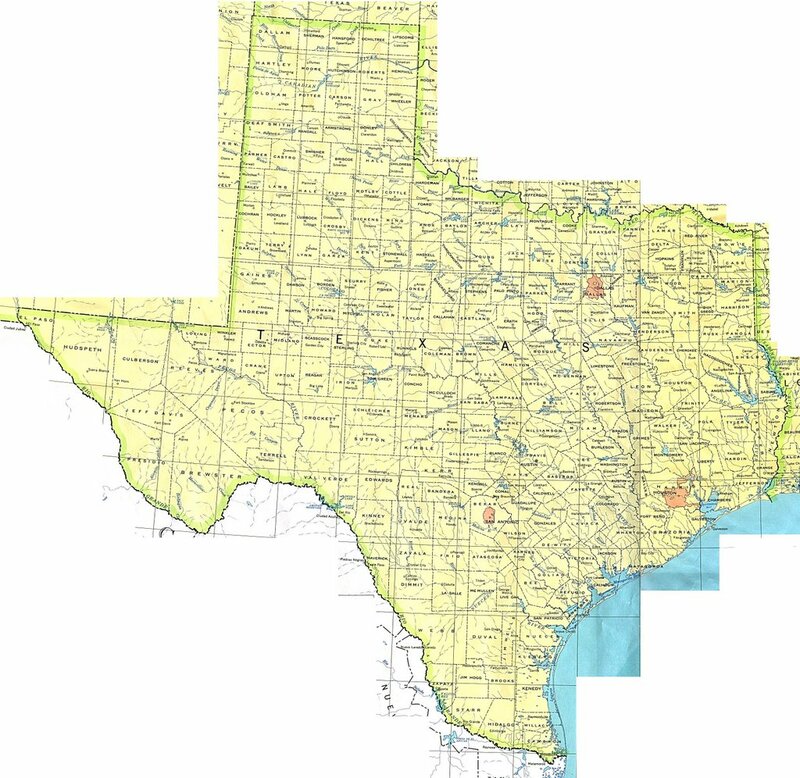 This trip marks Leigh's introduction to Texas specialties, and I'm looking forward to seeing her reaction to Plain Chachalaca, Great Kiskadee, Green Jay and the other species on her wish list. We've teamed with Sheridan Coffey, who generously offered to guide us on Sunday and Monday. The tentative itinerary includes Anzalduas County Park, Bentsen-Rio Grande Valley State Park, Santa Ana NWR, Chapeno, Falcon State Park and Sabal Palm Audubon Center. Lo and behold, the clouds did not drip at 6 a.m., so my walking shoes hit the wet asphalt on Magnolia Street. The neighborhood appeared to sleep still. The birds, however, had awakened. Bushtits twittered in the trees but remained invisible. American Crows silently glided from tree to telephone wire to tree. A Northern Mockingbird sat on a telephone wire and appeared to have woken up with a bad-hair day on the wrong side of the roost. The bird preened by repeatedly rubbing its head under its wings and shaking out its tail, grumbling intermittently. The wild parrots (Red-masked Parakeets?) took off from their palm-tree roosts near Costa Mesa Street. Their distinctive squawks and rapid wingbeats made the 14 birds stand out quite well as they flew southwest in the gray sky. Black Phoebes called from white picket fences and zipped across the street. I had hoped to see some sunshine in the form of a Cassin's Kingbird's yellow belly but failed to see or hear any of those flycatchers. The birds, however, hadn't failed to set an uplifting tone for a dismal-looking morning. In fact, they never fail to add color -- via their sounds and movements -- to an apparently lifeless scene. 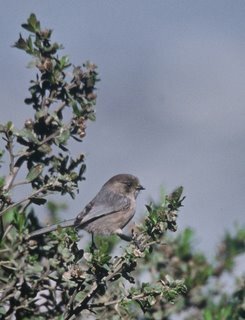 Bushtit courtesy of U.S. Fish & Wildlife Service. 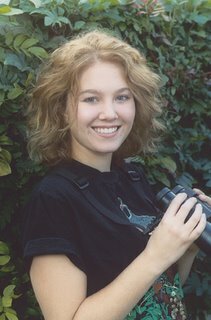 Do you know a young birder who wants to attend an American Birding Association birding camp, training workshop or convention but needs financial assistance? Please direct him or her to the ABA Scholarships page. The application, essay and letter of recommendation are due April 30. Young birders also can apply for the $500 WildBird/Clements Memorial Scholarship in honor of Dr. James Clements, who served on WildBird's Advisory Board. Details appear at the URL above. Want to see the locations of birding clubs and hotspots near and far? 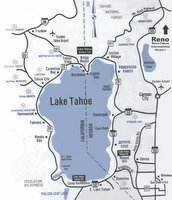 MapMuse.com recently created a nationwide map of clubs. When you click on a purple square, you'll see a new screen that pinpoints an organization's location. When you click on the square again, you'll see details about the club's name and website. 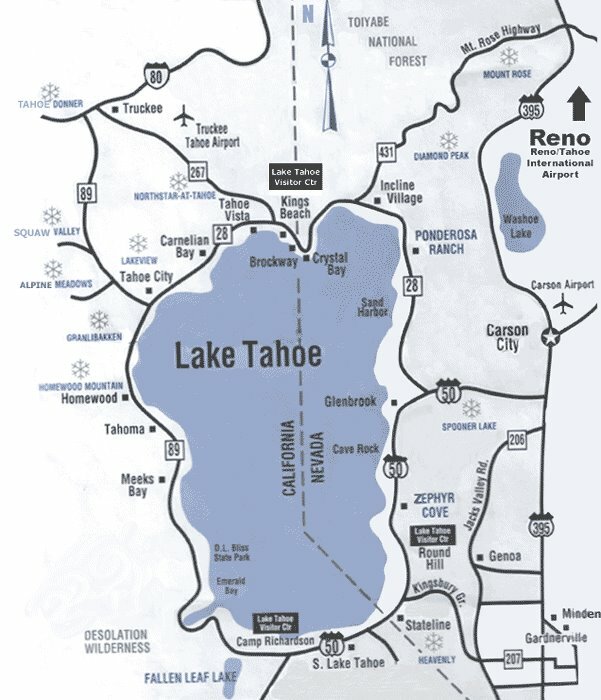 The current map appears to pinpoint only chapters of the National Audubon Society. This presents an opportunity for regional and local groups to add their locations and details to the map. The birding hotspots map contains only 13 locations today. We all know that the 48 contiguous states contain many more productive sites than that paltry number, so let's hop to it! Add your favored hotspots this week. The hotspots map offers more information than the clubs map does. When you scroll over a purple square, you'll see a small screen that might contain a photo and provides the name, address, phone number, specialty species, and amenities. When you click on the square, you'll see those plus a description. How could I resist a band with "corvids" in the name? It wasn't possible... nor is it possible to not enjoy this meaty rock album by Ken Layne & The Corvids. 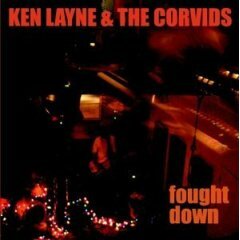 Some reviews called Fought Down "alt-country." I just call it darn good, particularly "Mama, Take Another Stand." Take a listen, and lemme know what you think. If the mention of the Eagle Cam at Maryland's Blackwater NWR piqued your interest about web cameras, check out the compilation of Birdcams at Beakspeak. 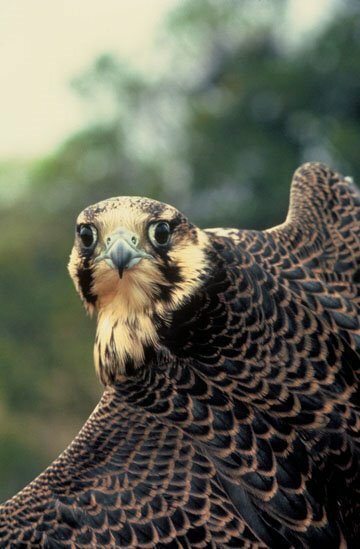 Peregrine Falcon seems to be the species of choice, with 28 web cameras recording their comings and goings, from New Hampshire to California and from Germany to Australia. If you know of online feeds not listed on that page, please send details. Ingraham shared some images to give birders a better idea of what the search team faces, day in and day out. If you'd like to see a few more images from Arkansas, you can click here or on the Flickr badge on this page, at the bottom of the right-hand column. I didn't spend time with the search team but visited Brinkley during the Call of the Ivory-billed Woodpecker Celebration last month. How often do you link "wildlife" with "law enforcement"? Despite growing up with a police officer and a victim/witness coordinator for the criminal justice system, I don't readily connect "law enforcement" with birding. Undercover investigations and criminal prosecutions just don't jive with my concept of wildlife. Luckily, lots of individuals take on the responsibility for making sure that criminals do not get away with illegal activities related to birds. 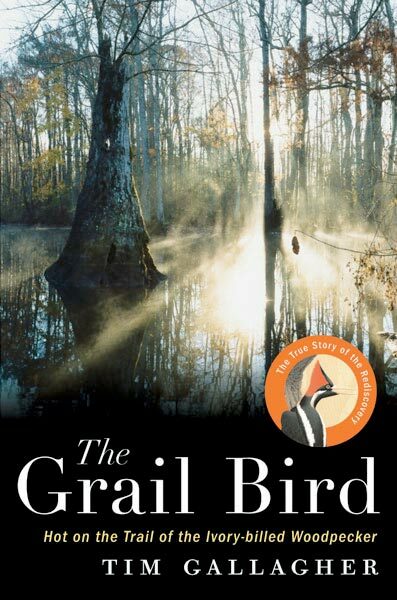 One such individual, Special Agent Jack Baker in North Carolina, recently received the 2006 Guy Bradley Award for wildlife law enforcement. - investigations related to Bald Eagle poisonings and the illegal destruction of eagle nest trees. In fact, because of Baker's work, one landowner had to pay almost $100,000 in restitution after cutting down a nest tree with two immature, flightless eagles. Congratulations and many thanks to Baker! Beginning Monday, the Census Bureau will interview more than 85,000 households for the 11th National Survey of Fishing, Hunting and Wildlife-Associated Recreation. 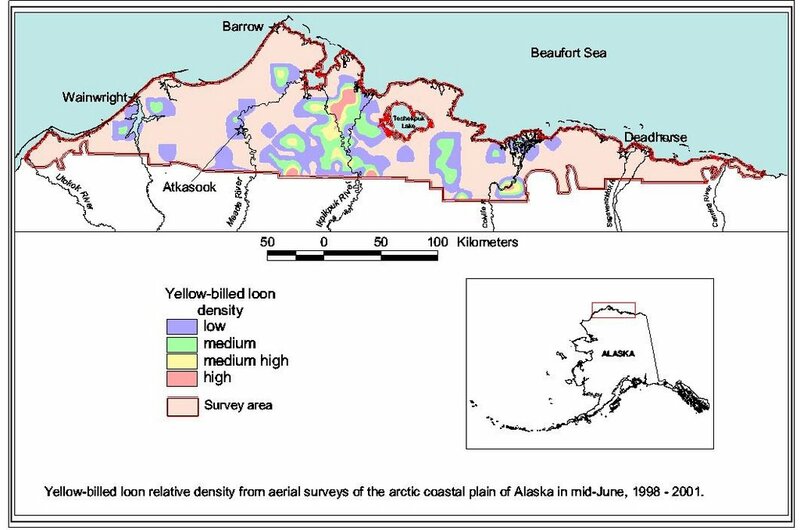 Begun in 1955, the survey takes place every five years and provides wildlife agencies, journalists, local governments, conservation groups and the outdoor and tourist industries with vital data. Why should birders care? Because the results of these surveys can determine funding for birding-related sites, programs and events. If you receive a telephone call from the Census Bureau between March and May or September to October, please participate in the confidential survey. The survey results will appear in a national report and in state reports. Preliminary results will appear in spring 2007; final reports, fall 2007. You'll find details about the 2001 survey and the results at the link above, such as "Over 82 million U.S. residents 16 years old and older fished, hunted, or wildlife watched in 2001. During that year, 34.1 million people fished, 13.0 million hunted, and 66.1 million participated in at least one type of wildlife-watching activity including observing, feeding, or photographing wildlife." Too often, good deeds go unrecognized. Today, the good deeds of three men and a group of volunteers will be recognized during the 71st North American Wildlife and Natural Resources Conference in Columbus, Ohio. During the National Fish and Wildlife Foundation/U.S. Fish & Wildlife Service Director's reception, officials will award the four 2006 National Wildlife Refuge System Awards. 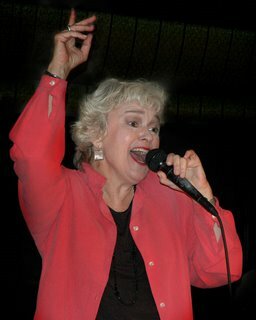 Susan Krebs, the self-described Jazz Gardener, credits dawn choruses with sparking her current musical offering, Jazz Aviary. She'll combine jazz music with poetry and birdsong on March 24 and 31 and April 1 in Silver Lake. Want to see our national symbol live and in per... wait, ummm... live and in action? If you can't hit the highway, hit the Internet. You'll see two eaglets at Maryland's Blackwater NWR's Eagle Cam. The image reloads every 30 seconds. If you know of a really good, local site, please share it in the comments! An example of "sustainable development"? As you can see above, Audubon International's slogan is "helping people help the environment where they live, work and play." Amid its menu of programs are the Audubon Signature programs: Bronze, Silver and Gold. The Audubon Signature Programs offer comprehensive planning and educational services to help new developments protect natural resources, both on and off site. By working closely with planners, architects, managers, and key stakeholders, Audubon International ensures that biodiversity conservation, environmental quality, and sustainable management are built into the project and continue after construction is completed. Why should birders care about this? Because efforts to "design, build and manage with nature in mind" are worthy of our attention, as are the results of these programs. Developments like this, while currently limited to upscale areas, are encouraging, yes? Do you know of an organization that needs funds to replant native Gulf Coast trees that were destroyed by Hurricane Katrina? If so, that organization can apply for a Katrina ReLeaf grant from American Forests. Do you want to donate money to Katrina ReLeaf? This page allows you to easily donate $10 for 10 trees or $15 for 15 trees. Have you been following the discussion on the I.D. 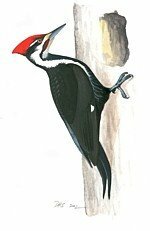 Frontiers listserv about the current evidence for the Ivory-billed Woodpecker rediscovery? Field-guide author, speaker and WildBird Advisory Board member Kenn Kaufman posted interesting thoughts last Friday, and the thread remained active today. The future of birding and the conservation of birds and their habitats depend on the cultivation of the next generation of birders. I don't say that lightly; you'll find it in the mission statement that appears on the table of contents in each issue of the magazine. The American Birding Association and Leica Sport Optics cultivate the next generation by coordinating the ABA/Leica Young Birder of the Year contest. The competition incorporates four modules (field notebook, writing, photography and illustration) for two age categories (10-13 and 14-18) and provides prizes to an overall Young Birder of the Year for each age group and first-, second- and third-place winners in each module. Luke Seitz won first place in his age category's field notebook module. This year, the 10- to 13-year-old Overall Young Birder of the Year award went to Luke Seitz of Falmouth, Maine, and the 14- to 18-year-old Overall Young Birder of the Year honor went to Adam Nisbett of St. James, Mo. They'll receive some great prizes (including a one-year subscription to WildBird!). Adam Nisbett won first place in his age category's field illustration module. The complete list of winners appears here. David Sibley: "...kicked in the stomach"
In the United Kingdom's telegraph.co.uk, David Allen Sibley recently writes that he "felt like I had been kicked in the stomach." 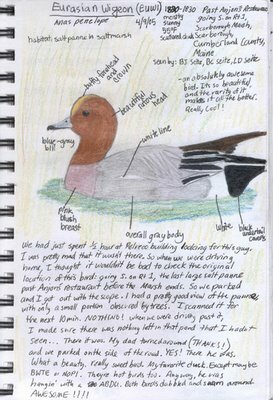 The Massachusetts-based artist and field-guide author describes eight days in Arkansas last May. Read about it here. Thanks to proceeds from Duck Stamp sales, the Migratory Bird Conservation Commission recently approved more than $3 million to purchase almost 2,200 acres of wetlands and associated habitat. Those purchases will add to national wildlife refuges in Vermont, New Jersey, Louisiana, Texas and California. The commission also allocated more than $18.5 million for 35 conservation projects in 18 states and Mexico. The funding will come from the North American Wetlands Conservation Fund, and partners in 19 U.S. projects will contribute almost $65 million. 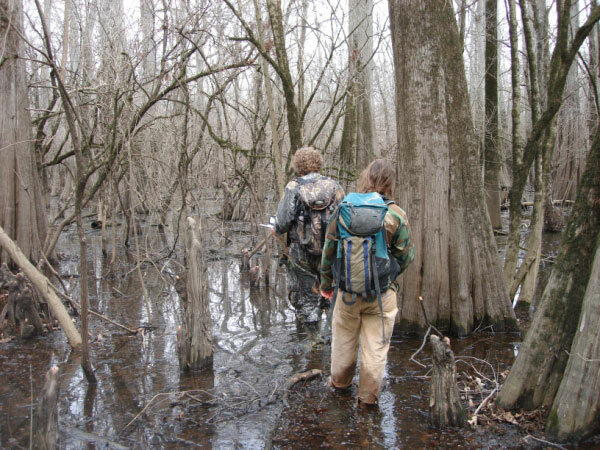 That money will allow the restoration of more than 105,000 acres of wetlands. Mexican partners will contribute more than $3.8 million toward the conservation of almost 36,000 acres. Did you hear about the recently discovered fossil in southern Germany? 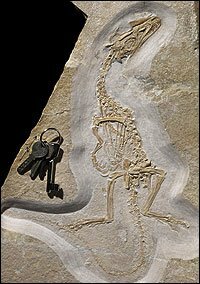 The 150-million-year-old fossil found in the Jura Mountains measures 2.5 feet long, and its bone structure makes it one of the feathered dinosaurs. Because all of its close relatives are feathered, paleontologists would expect Juravenator to follow suit. But a small patch of skin on Juravenator's tail shows no sign of feathers. And the skin also doesn't have the follicles that are typical of feathered dinosaurs, said Luis Chiappe, director of the Dinosaur Institute at the Natural History Museum of Los Angeles County. Last year's contest included a digiscoped image that won first place in the international category. David Drake's Purple Honeycreeper, captured at Asa Wright Nature Center on Trinidad, won that honor. The contest offers five categories (amateur, backyard, digiscoping, flight and water birds), and each category offers first-, second- and third-place prizes including Kowa binoculars, Droll Yankees feeders, Nikon optics, Bushnell binoculars and Leupold & Stevens binoculars. The contest also offers a grand prize: a Canon EOS 20D digital SLR. Details about the prizes as well as the rules and the entry form appear in the March/April and May/June issues. (They do not appear online.) The entry deadline is April 29. If you send an entry, please make my job easier by writing the entry's category on the lower left-hand corner of the envelope. That would make sorting 1,900 entries into the appropriate boxes a wee bit simpler. Thank you! The U.S. Fish & Wildlife Service now seeks public comments about the draft conservation agreement for Yellow-billed Loon. The 27-page draft outlines goals, objectives, conservation concerns, conservation strategies and actions, and a conservation schedule among other topics. The goal of this Agreement is to protect these birds and their breeding, brood-rearing, and migrating habitats in Alaska. In so doing, the partnering agencies hope that current or potential threats in these areas can be avoided, eliminated or reduced to the degree that the species will not become threatened or endangered as a result of such threats within the foreseeable future. You can submit comments--but not anonymous ones--by snail-mail, fax or e-mail and in person to the Fairbanks, Alaska, office. 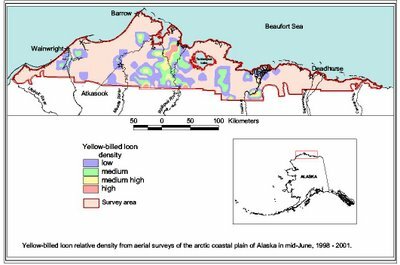 Given strong sentiments about Alaska within the birding community, I wonder how many birders will contribute their knowledge to this discussion. "Bad toupee" = more money + more birders? If it stays around, Geier said, the Caracara could actually be a boon to the economy, as word gets out and more and more birders come from farther away to see it. “Potentially people could come down from (as far as) Seattle,” Geier said. And the longer the Caracara stays, the more people who might rent hotel rooms and spend money in town, in pursuit of the bird. It’s not too hard to find it, just look for birders who’ve already spotted it. “Look for a knot of people looking intently at something with happy looks on their faces,” he said. 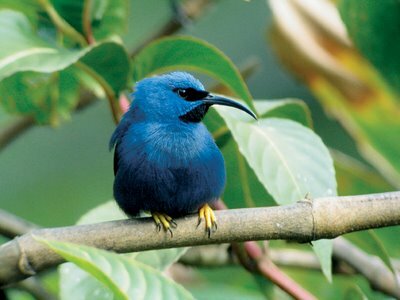 The article raises another potential benefit from out-of-range species: increased interest in birds and birding. As for Jan Lane, who first spotted the unusual bird, she may end up driving down from Blodgett to see her new friend again. I can’t remember how many foot massages I promised. A note to non-birding wives of birders — get everything in writing. A birder “jonesing” has absolutely no recall of any promises or sacred oaths. And speaking of massages, I'd like to ask that more festival organizers work with local massage therapists to offer neck, shoulder and even foot massages to festival attendees. The birders likely would benefit from the tension release, and the therapists might make a tidy sum. I know of one event -- Space Coast Birding & Wildlife Festival -- that included a massage booth in the vendor hall. Are there more? Today marks the 103rd birthday of the National Wildlife Refuge System. Begun by President Teddy Roosevelt, the system now includes 545 refuges throughout the states and provides habitat for more than 700 species of birds. More than 250 threatened or endangered species live on refuges, and the presence of those at-risk species — such as Hawaiian Coot, California Condor, Kirtland's Warbler and Florida Scrub-Jay — prompted the creation of some refuges. 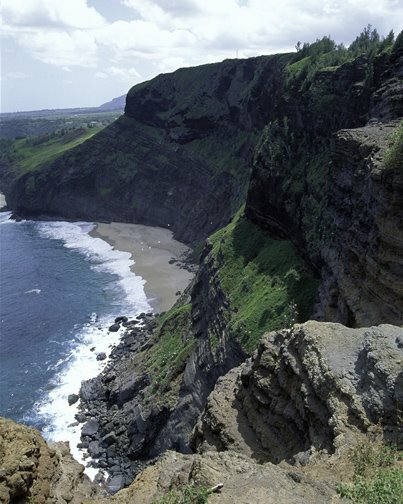 Kilauea Point NWR on the Hawaiian island of Kauai provides habitat for the state bird, Nene (nay-nay), among other species such as Pacific Golden-Plovers. The island includes two more refuges: Hanalei, which hosts endangered native waterbirds, and Huleia, which also provides habitat for at-risk waterbirds such as Hawaiian Stilt (Himantopus mexicanus knudseni). Roosevelt established the first refuge at Pelican Island in Florida in 1903 to protect Brown Pelicans from hunters. To celebrate the refuge system's birthday, Pelican Island NWR and other refuges planned celebratory events. Maybe you can join the festivities at a refuge near you this month! For four days in February, birders became citizen scientists and counted birds in their back yards and just about everywhere else. Between the 17th and the 20th, participants in the annual Great Backyard Bird Count identified 623 species and counted 7.5 million individual birds. This year, birders submitted more than 60,000 checklists, making the 2006 event the second-highest in participation. The number of checklists set records in three Canadian provinces (Ontario, British Columbia and Alberta) and 15 states (including New York, Pennsylvania and Virgina). 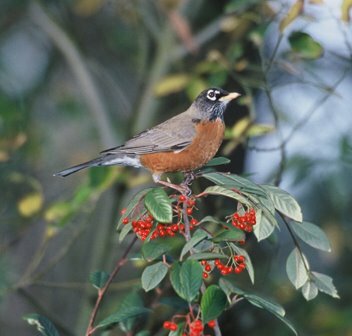 Among the interesting observations: The Pacific Northwest saw more American Robins this year; observers reported flocks of 40,000 or more robins. Participants also reported an irruption of Snowy Owls. For more highlights about the results, look here. Consider contributing to next year's count on Feb. 16-19. Nevermind the singing birds in their bright feathers. Other occurrences reveal the changing seasons here. 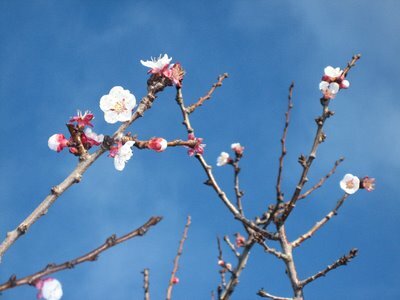 The bare apricot tree in my back yard decided to grow some flowers. Perhaps this year, the tree will actually produce fruit instead of just teasing us like last year. And if it does produce apricots, perhaps the birds will generously allow me to pick just a few orbs rather than claiming all the fruit for themselves (not that I really mind sharing, mind you). 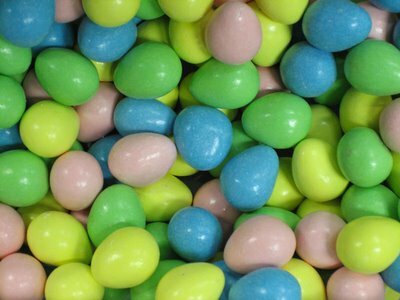 The once-a-year Easter candy adorns the store shelves. A friend contributed a bag of Reese's Pieces pastel eggs to the sugar container that sits next to my office door. Birds' eggs aren't the only eggs to anticipate at this time of year! Would you like to own an original watercolor by artist John P. O'Neill? 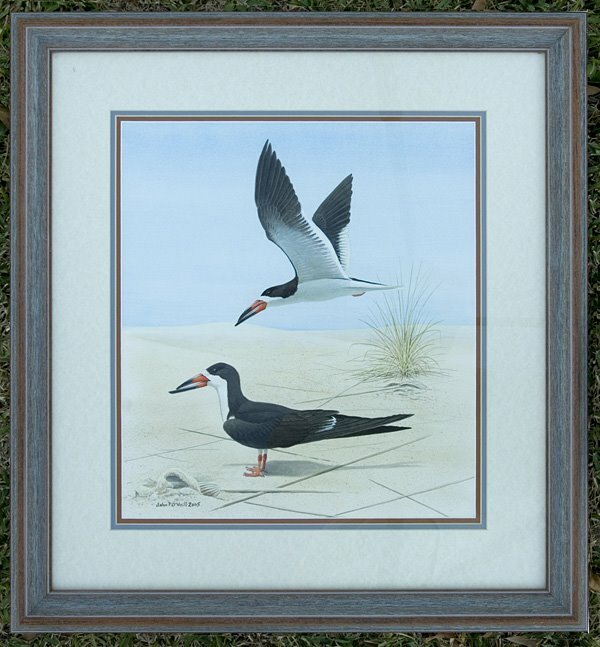 If so, you can bid on these Black Skimmers during the Great Texas Birding Classic's online auction. It will end April 28 at noon. - more on the way! The online auction and its real-time counterpart in late April will raise money to be distributed as conservation grant dollars. Those dollars will go conservation projects selected by winning teams in the Classic, "the longest and wildest birding event in North America." This year, the Classic celebrates its 10th anniversary and its success in raising $500,000 for habitat conservation in the Lone Star State. In previous years, young birders sponsored by WildBird earned the privilege of choosing conservation projects to receive the grant dollars. In fact, the WildBird team won or shared first place in the weeklong tournament six times and won second place once. 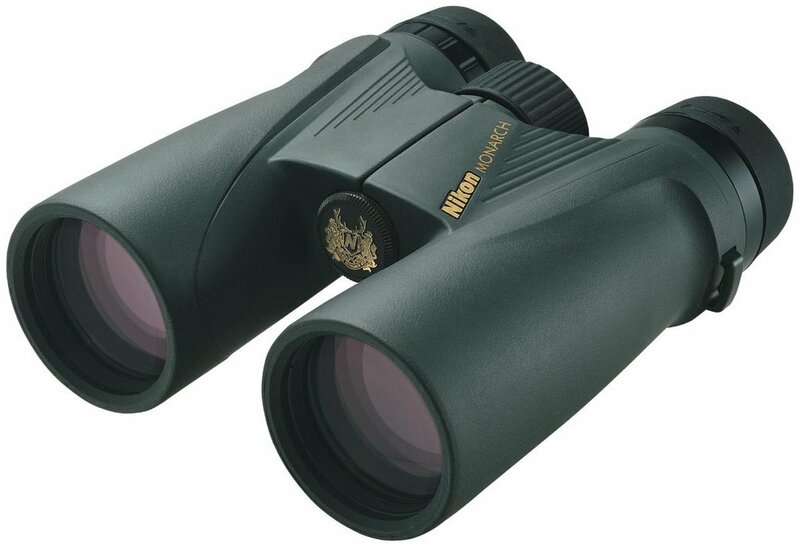 This year, WildBird teamed with Nikon Sport Optics to sponsor a team of four young birders in the weeklong tourney. More details soon! A generous anonymous coworker gave me a copy of the Times' weekend Calendar section this morning. 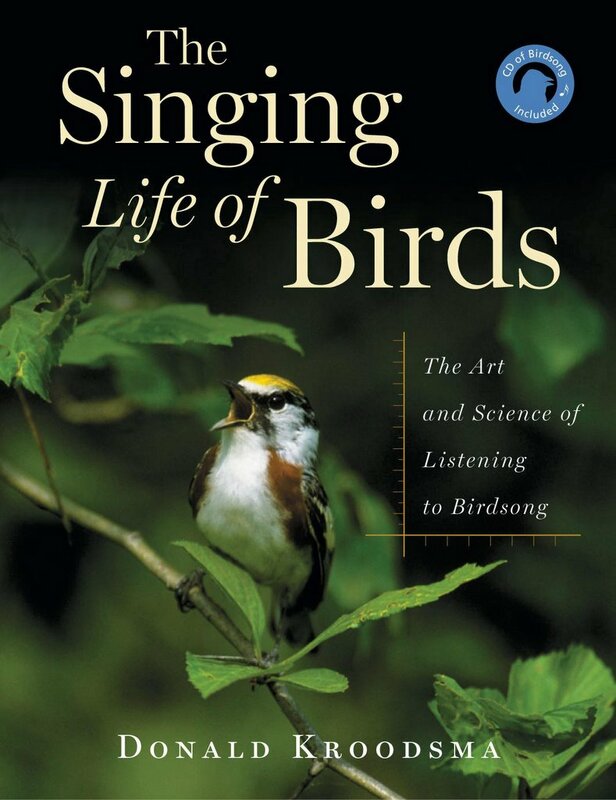 The cover blurb: "Paradise of Birders: Not far from your favorite freeway, Southern California offers havens for that species of naturalist with an avian avocation." Inside, the headline read "Flights of fancy: Angelenos might see the city as a concrete jungle, but to nearly 500 species of birds and those who watch them, it's a rustic aviary." 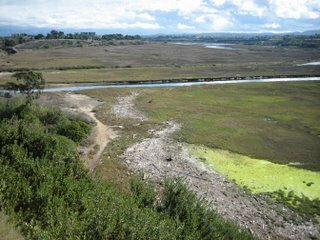 One sidebar listed seven birding sites, such as Upper Newport Bay Nature Preserve aka Back Bay (above). The other spots included El Dorado Regional Park in Long Beach, Ballona Wetlands, Madrona Marsh in Torrance, Malibu Lagoon, Santa Fe Dam Recreation Area in Irwindale and Sepulveda Basin Wildlife Reserve in Van Nuys. The article included a field guide description of a "bird-watcher." 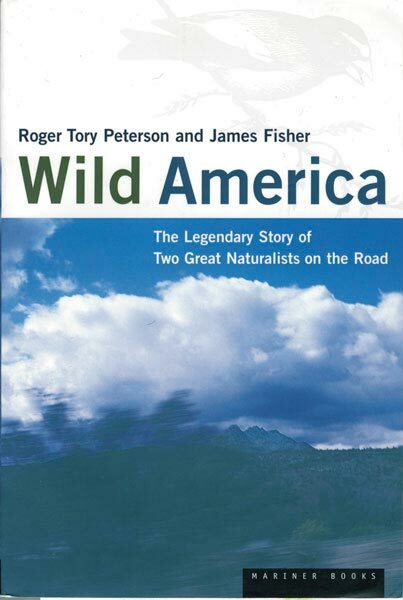 Description: The average American birder is 45 and older, Caucasian and relatively affluent. Adults of the species typically wear earth-tone colors, L.L. Bean jackets and hiking boots. Binoculars and fanny packs are common accessories. 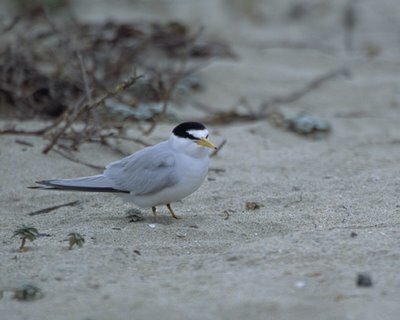 It also cited voice, habitat, nesting and range. What do you think of its necessarily concise portrait of birders? 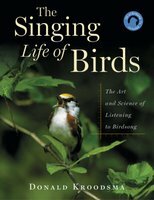 1st annual The Best of Birding survey! The survey form appears on pages 43 and 44 of the January/February 2006 issue. It will appear in the upcoming May/June issue too. We ask that you tear out that page (photocopies will not be accepted) and mail the completed form before July 1. Just pick up a copy of the January/February 2006 issue (the one with the preening Northern Cardinal on the cover), and turn to page 43. Also look for the survey in the upcoming May/June issue, and start making notes about which squirrel baffle, 7x42 binocular, tripod, regional field guide, festival, national forest, listserv and other items fit your definition of "best." Want to see Cerulean Warblers and Ivory-billed Woodpeckers fly out of your hands? Put 'em on your snail-mail envelopes! 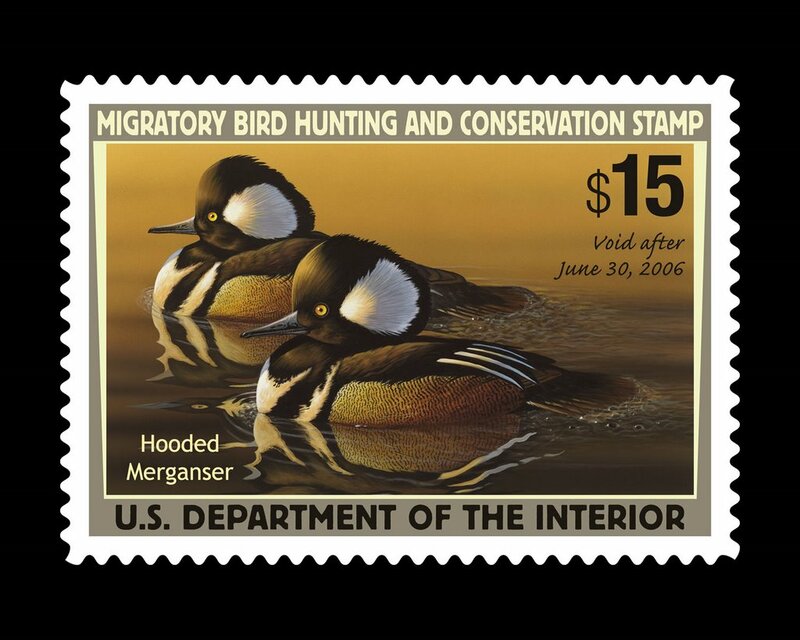 American Bird Conservancy now offers the first U.S. postage stamps to benefit bird conservation. The 39-cent stamps are available through the ABC website. The nonprofit ABC is considered a top-rated charity by Charity Navigator, and more than 25 percent of the net proceeds will go to ABC's conservation programs. The stamps spread the word about restoring American songbird populations and halting species extinction. 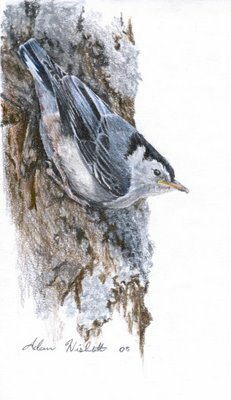 Graphic designer Gemma Radko used a photograph by bird bander Robert Mulvihill to create the warbler stamp, while artist Todd Telander painted the woodpecker stamp. Speed on over to The Birdchaser for this month's first installment of the birding blogosphere's carnival.